Gentlemen, and Ladies, and those who are still not too sure, I am currently in the market for a new bivvy. My trusty JRC has a leak, and is not going to be good enough for my coming winter campaign, mainly 'cos it's single skinned, and thereby, not the warmest piece of kit. So, what do you suggest? My criteria are: must be under £200 (can't justify huge expense, on a bivvy that will only be used one night a week, in the main) and must be quick to put up and take down - can't be doing with threading poles through anything! A One man job, as most of the swims on my syndicate, are quite tight. Ive got the Nash Double top professional. Had it for a couple of years now. I like the porch as it has a bit that overhangs so you dont get annoying drips from rain etc. Has an internal layer as well. Rear vents, to maximise air flow during hot weather. Thanks mate. I have actually been considering a Double Top Professional, so that's really helpful. nash titan... quick and easy, and solid as a rock!!! Thanks peoples, for your help and advice. 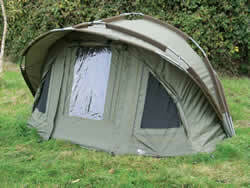 I have ignored it all, and bought a Chub Cyfish mk2 1-man, bivvy. This was from advice on the bank, and seeing one set up and taken down again. It's a good bit of kit, and although mine hasn't been used yet, I did set it up in the garden and it's easy-peasy!